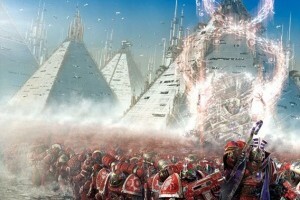 Censured at the Council of Nikea for his flagrant use of sorcery, Magnus the Red and his Thousand Sons Legion retreat to their homeworld of Prospero to continue their use of the arcane arts in secret. But when the ill-fated primarch forsees the treachery of Warmaster Horus and warns the Emperor with the very powers he was forbidden to use, the Master of Mankind dispatches fellow primarch Leman Russ to attack Prospero itself. But Magnus has seen more than the betrayal of Horus and the witnessed revelations will change the fate of his fallen Legion, and its primarch, forever. This was one of the stories in the Heresy I’d wanted to get to for a long time. It’s one of the great big stonking milestones of the story, and is one of the most tragic of the lot. We’d gotten together a long time ago to talk through the story of the Thousand Sons, working out the kinks that existed in the background; the how, why and wheres, but it was a long process. A lot of the story threw up ‘But why didn’t… Why would you…?’ moments, and the tricky part came in answering them in a way that didn’t break the existing background. Dan and I went back and forth on this, and as has been said many times before, he originally wanted to tackle the Thousand Sons, and I would do the Wolves. The more we talked over the different Legions and their motivations behind this story, the more our perceptions shifted and we decided to switch. It sounds simple, but there was a lot of story wrangling between the switch. So with the Thousand Sons my boys now, I set to work in making them absolutely mine. There was next to nothing written about their organisation within the Legion, but if there was any one Legion who would take it upon themselves to reorganise things to how they thought they should be, it would be them. The Thousand Sons needed to walk, talk, fight and just be different to other Legions. They couldn’t just be the same as Ultramarines, but in red armour, shouting ‘For Magnus!’ instead of ‘For Guilliman!’ They needed to fight differently too, since their powers defined them and made them who there were. In fact, fighting was pretty much a last resort for them, because what can you learn from a dead enemy? The story evolved, taking in the events we’re familiar with and some that we aren’t. The opening part of the book on Aghoru I took my time with, deliberately holding off on the action until we’d really established who the Thousand Sons were. I wanted to tell their stories and establish the character of the Legion, its warriors and its attendant remembrancers before unleashing so much as a single shot. It’s a slower beginning to many other Heresy books, but I make no apology for that. When the Thousand Sons used force, it was because there was no other option. From that point on, it was a case of gradually feeding in more and more cracks in the façade of the Thousand Sons, to show that, yeah, they know more than us, but they’re not infallible. When you think you know everything, you start treating folk around you as stupid, and believing that you know best, which is a terrible mistake. As the story went on, I tackled events that we’re more familiar with, the Triumph on Ullanor, the Council of Nikaea, but I didn’t want to get bogged down in them, as the real money shot of this book was going to be the battle of Prospero. The Triumph was shown as I needed to introduce the Custodians and let the readers know that Magnus had been in contact with the Emperor. And it gave me a chance to have a brief cameo from Hastur Sejanus – who we’d only previously seen as a dead man. With those elements of the story told, it was time to crack up a gear towards the big fight at the end. This was where I needed to really get behind the curtain and figure out some of the – apparently – strange decisions Magnus made. Why did he choose to contact the Emperor the way he did? How could a planet of sorcerers with warriors who could see the future be surprised by a Legion not known for their subtlety? This was where I got to really get inside Magnus’s thoughts and throw up his colossal vanity and ego, where the utter belief in his own superiority tripped him up. Here was where the full scale of the Chaos Powers’ endgame became tantalisingly visible. Here was where Magnus realised that he didn’t know best and that he’d been played. Worse, it wasn’t just him that was going to pay the price. And then there was the battle. I drew out a map of Tizca, marking it with landmarks, locatins, streets and the various temple pyramids of the Thousand Sons cults. This made it so much easier to plan out and write the battle, as I knew who was doing what and when. Since it was going to be a while before Dan was able to get to this part of the story in Prospero Burns, I sent him a copy of the maps and battle plan to make sure it gelled with what he wanted to do. Then I got on with writing it, and it was a mammoth undertaking, filled with character vignettes, epic battles that ranged from the huge and sweeping with a cast of thousands, to individual moments that were almost intimate in their smallness. A good battle scene, however long, has to run the gamut of emotions and scenes, following the tension/release idea of the overall story, and this was no exception. It was pretty unrelenting, but I found moments of stillness within the battle, were the characters could breathe and the full scale of what was happening could hit them. All of this led to the big battle with Magnus and Leman Russ. I knew from the outset, that I’d be playing this coy, as it felt more in character to tell the meat of this fight from the Space Wolves side of things. The Thousand Sons see the fight, but they don’t participate in it, they watch as their Primarch takes a beating and are powerless to stop it. Reconciling the conflicting accounts of this fight was pretty easy actually, as Dan and I had always imagined both books to be a retelling of this event as told from the perspective of the Legion we were writing about. A Thousand Sons is a long, long book. The longest of the series in fact. It got longer as I told it and is a very special book for me. Not least because my own Son, Evan, was born as I was writing it. It’s also a book that’s done amazingly well commercially, knocking True Blood’s Charlaine Harris from the top spot of the UK SF/Fantasy charts, and then going on to become a New York Times bestseller. It took me a couple of days to really understand the scale of what that meant, and I think a little of it has yet to sink in – despite the surprise party BL threw me when it came out. We had cake with little pyramids on it, party poppers and non-alcoholic champagne to celebrate. And Emma almost put out my eye with a party popper, which would have been an appropriate, if painful, mutilation given the appearance of Magnus. Though it was a long book, I enjoyed it immensely, as I felt it was really working on the page. It was fun to take a Legion folk had already pigeonholed as Evil, and make them into something different, while still holding true to their 30k story and their 40k appearances. Making Magnus a tragic figure and Ahriman a likeable one was something I knew I wanted to do from the outset, and that it has surprised lots of people is fantastic. Suddenly a story they thought they knew has been turned on its side and the Legion no-one had any sympathy for are now looked at as convenient scapegoats and victims. No doubt that’ll change when Prospero Burns comes out – as it should! – but for now they’re the heroes of this doomed tale.